Do you have a few hundred thousand or maybe even a few million dollars burning a hole in your back pocket? Itching to order some original artwork from Amazon? Well, now you can! I know what you're thinking - are these paintings really going to go well hung above your Value Village couch? But wait... they even offer free shipping. That just might tip the scales! Just make sure you are going to be home to sign that delivery authorization! Of course the real question is... Where do these works come from? Are they stolen? Well, that just means it was previously owned, and I know you like that! Was it owned by Brad Pitt? Madonna? The Prince of Wales? Kind of makes you wonder why they had to give it up, doesn't it? At the very least check out the reviews - they are worth a good laugh! 1888 by Louis Hayet - This enchanting waterscape by French artist, Louis Hayet depicts an ethereal sunrise in the historically important town of Pontoise. 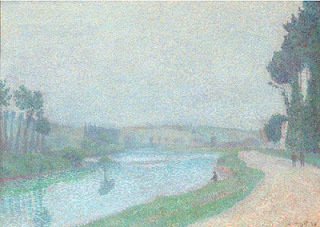 In this stunning painting depicting the banks of the Oise River, a pointillist sky is painted so that it is shimmering and radiant, and the water reflects a luminous world. 1972, by Andy Warhol - Andy Warhol was born in Pittsburgh in 1928. 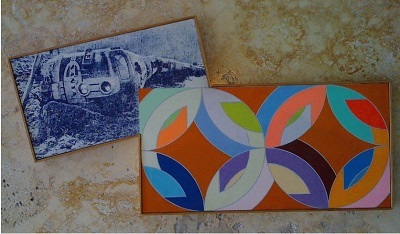 In 1945 he majored in pictorial design at the Carnegie University. 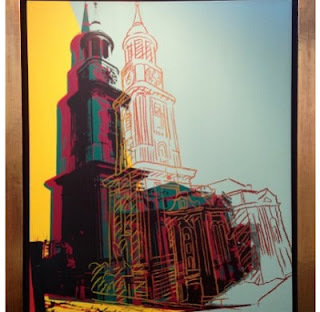 Upon graduation, Warhol moved to New York where he worked as an illustrator for several magazines including Vogue and the New Yorker and did advertising and window displays for big retail stores. 1972, by Richard Pettibone - Seen as a copycat by some, and as an appropriationist to others, Richard Pettibone is an iconoclast who, during the course of four decades, has turned notions of originality on their head. 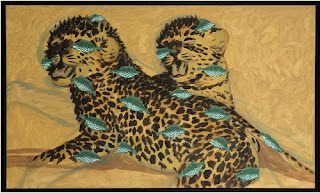 Pettibone made it his mission to reproduce the reproductions, albeit on a smaller and more appealing scale. 1923, by Frank Weston Benson - Frank Weston Benson attained his initial success as a portrait and figure painter, using interior and exterior compositions, for which he used both professionals and his children as models. 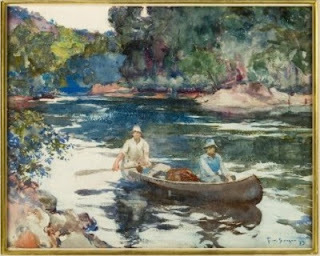 While he never abandoned this sort of painting, in 1912 he began depicting game birds and waterfowl with greater frequency. 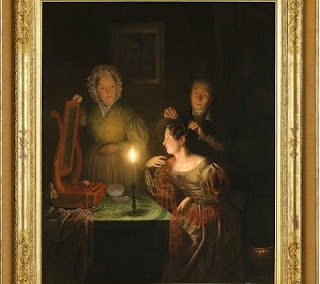 1835, by Petrus Van Schendel - Petrus van Schendel is probably best known for his outdoor market scenes, with their heavy ambiance and figures shrouded in a haze of mystery. This delightful and rare painting, Before the Ball, demonstrates this genre artist's ability to paint interior scenes with equal skill. 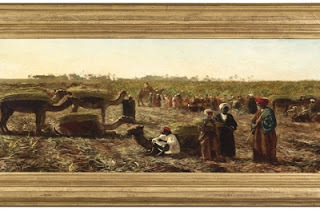 1876, by Edwin Lord Weeks - A farmer oversees the harvesting of his wheat crop in this exotic painting by American Orientalist artist Edwin Lord Weeks. His meticulous consideration to the people, customs and landscape in his paintings has made them among the most desirable Orientalist compositions ever created. 1876, by Marc Chagall - A beautiful and intimate portrait into the relationship of Chagall and his wife Valentina, The Artist's Wife presents the best of Marc Chagall's mastery over color, line, form, and emotion. A first-generation Abstract Epressionist, Willem de Kooning is one of the most important artists of the 20th century. 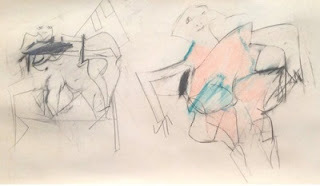 In 1950s New York, when painters like Jackson Pollock and Franz Kline were moving away from representational imagery toward pure abstraction, de Kooning maintained a commitment to the figurative tradition, developing a signature style that fused vivid color and aggressive paint handling with deconstructed images of the female form-a then-controversial body of works that has become known as his "Women" paintings. "Flesh was the reason oil paint was invented," he famously said. 1980, by Andy Warhol - The second most expensive artwork on Amazon Art. 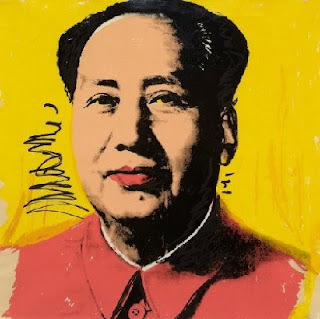 Born Andrew Warhola in 1928, Warhol was a founder and major proponent of the Pop Art movement. 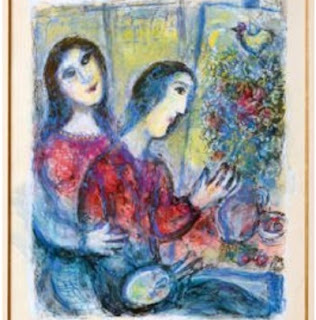 He remains one of the most talented and influential artists of the 20th century. 1941, by Norman Rockwell - And finally, the Amazon Art most expensive painting! 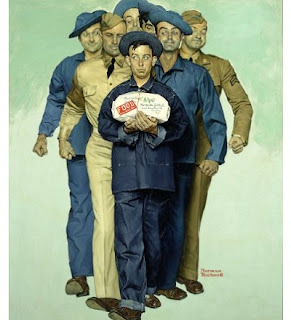 In his iconic Willie Gillis series of Saturday Evening Post covers, Norman Rockwell championed "the plight of an inoffensive, ordinary little guy thrown into the chaos of war." This engaging and recently discovered oil on canvas, entitled Willie Gillis: Package From Home, was the first of this series of 11 total covers about a young private during World War II, and Rockwell's fourth cover for the Saturday Evening Post in 1941. Amazon calls their art marketplace "one of the largest online collections of original and limited edition artwork for purchase directly from galleries and dealers." So, if you’re in the mood to browse, or spend a whole lot of money, this is the Amazon Art home page. Umm... I will take the two Andy Warhols, and the Norman Rockwell. Can I put that on my Mastercard? Can I get these cheaper on Ebay? How much tax is on $4.8 million? ?